Rave Reviews: DJ Nman--a.k.a. Nick Manousos--spins hard-core drum 'n' bass in the Jungle Room at the Vets Hall every Thursday. I'VE SEEN these walls sweat before. The close, corridorlike basement of the Santa Cruz Vets Hall quickly steams up when packed with dancing bodies. The walls develop a sweaty sheen, and the overhead plumbing drizzles with condensation. Scattered across the basement's linoleum, a couple hundred young people dance energetically. At ground level outside, in the narrow patio on the north side of the walled-in backyard, another hundred mingle, taking a break from the heat and humidity of the dance floor. The scene is familiar--throngs of young people, booming music--like any of the hundreds of punk rock shows the Vets Hall basement has hosted since time immemorial, but there's not a guitar in sight. And the crowd is laid-back, mellow even, not adrenalized into clacking out skateboard tricks in the parking lot or flying around inside performing dances of elbows, knees and boots. "We get a lot of different kinds of people," says Scott Knippelmeir, a member of the collective that organizes Colors, the weekly rave that has drawn this subdued crowd to the Vets Hall basement. "We get a lot of gay people, some people of color, and a lot of girls. Since we don't serve alcohol, the girls like it because it's not rough like a dance club. The guys don't want to fight because there's something better to do." Colors debuted in May and has taken to the Vets Hall basement every Thursday night since. It survived an initial rush of enthusiasm, and then an ebb in attendance as UCSC students left town for the summer. Knippelmeir says that the weekly rave has drawn its biggest crowds lately, as returning students swelled attendance to a record of 350 people. The 25-week run makes Colors one of the longest-lived rave events in Santa Cruz. Bassic Elements was the first, presenting a night of drum 'n' bass at Moe's Alley every Tuesday. Started in January 2000, Bassic Elements ran until summertime that year, when sparse crowds caused the organizers to call it quits. Nick Manousos, a tall, thin UCSC senior who wears wire-rim glasses and a buzz cut, regularly took a shift behind the turntables at Bassic Elements. Manousos trades under the DJ handle "Nman," and he spins hard-core drum 'n' bass, a music of frenetic drum squalls and gut-churning foghorn bass lines. 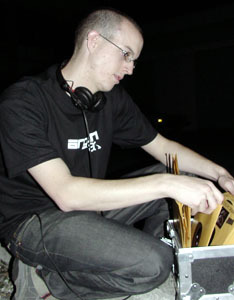 For the past four years, he has hosted the Metallic PLUR radio show, which broadcasts drum 'n' bass every Sunday night on KZSC-FM (88.1 ) between 8:30 and 10:30pm. Tonight, Manousos spins tracks in a backroom of the Vets Hall basement--the "jungle room"--which is dedicated to drum 'n' bass music. Half of the basement's main expanse thuds with the regular bass drum of funky house music, but here, the walls vibrate with off-kilter beats and big bass lines. A dozen people hop about in jerky dances in the middle of the room, shielded from the sweat-rain by a camouflage netting hanging from the ceiling. Another dozen dancers spill out into the main room. Around the edge of the jungle room, several people nod their heads to the music. Instead of dancing, they're soaking in the extra bass frequencies that pile up along the walls. "It's always been our dream to do an all-ages dance club," Manousos explains after his set. He and a few others organized a drum 'n' bass night at a local dance club earlier this year, but the 21-and-over crowd and the nightclub setting didn't foster the right vibe. So one day Manousos called the Vets Hall to see how much it would cost to rent the basement for a night. Instead, Vets Hall management wanted to co-sponsor Colors. In return for half of the money collected from the $5 ticket price, the Vets Hall provides the basement space and a sound system. "This came up, and it seemed like a good idea, like it would be a good venue for college kids to hang out and dance," says Tim Brattan, executive director of the Vets Hall. "We did it with the intention of not making a lot of money--we were going to commit to it and see where it goes. And I think now it's starting to make some money. In the profit world, it wouldn't be possible, but for us it's a success, and it's becoming a financial success now." Divercity Productions presents Colors from 9pm to 2am Thursdays at the Vets Hall, 846 Front St., Santa Cruz. Tickets are $5, free before 10pm. For more info, visit www.divercityproductions.com.